Compatible with the Amazon Alexa virtual assistant, the four new printers enable Amazon account holders to issue voice commands such as "Alexa, start 'Canon Printer' and 'print a coloring page'" to an Amazon Echo or other Alexa-enabled device. This feature makes it possible for consumers to print materials such as coloring pages and number place puzzles using only their voice. 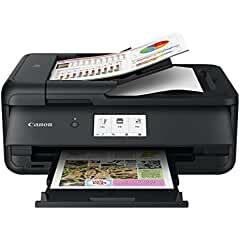 Users can also confirm their printer's status, such as remaining ink levels, using voice commands. Canon plans to include support for such Google Assistant-enabled devices as Google Home™ towards the end of 2018, which will then enable Google account holders to print content and confirm printer status information using voice commands as well. "At Canon, we are continually innovating to enhance existing products and develop new devices that will fit seamlessly into the everyday lives of our users," said Kazuto Ogawa, president and COO, Canon U.S.A., Inc. "With voice-enabled printing, Bluetooth connectivity and printing from compatible smartphones2, users can print with convenience and flexibility, while still achieving the same level of quality that is synonymous with Canon products." The PIXMA TS9520 Printer offers premium quality and functionality benefits to print, copy, scan both documents and photos beautifully including 11inches x 17 inches documents. The printer also features an enhanced multipurpose tray, enabling users to print on select materials other than paper, such as disc labels, providing a variety of home office output functions all in one machine. Canon's 4-in-1 compact business and home office inkjet printer, the PIXMA TR4520 supports automatic copying of multiple sheets with an automatic document feeder (ADF). In addition, the printer can copy both sides of an ID card or card-sized documents automatically and can fax documents.